RINSE the mixed greens to get rid of any sand and use a salad spinner to remove the excess water. RINSE the cucumber and cherry tomatoes. CHOP the cucumber in small pieces and the tomatoes in half. SLICE the scallions into small pieces. SQUEEZE juice from the lime for the dressing and mix with pepper and salt. Slowly ADD the sunflower oil and keep on mixing until you’ve reached the desired thickness. If needed, season with some more pepper or salt. HEAT frying oil to about 180 degrees celsius or 350 degrees fahrenheit. BEAT one egg in a small bowl and add some breadcrumbs to the other small bowl. CHOP the goat cheese into thick pieces. COAT the pieces of goat cheese with egg first and then cover them completely with the bread crumbs. 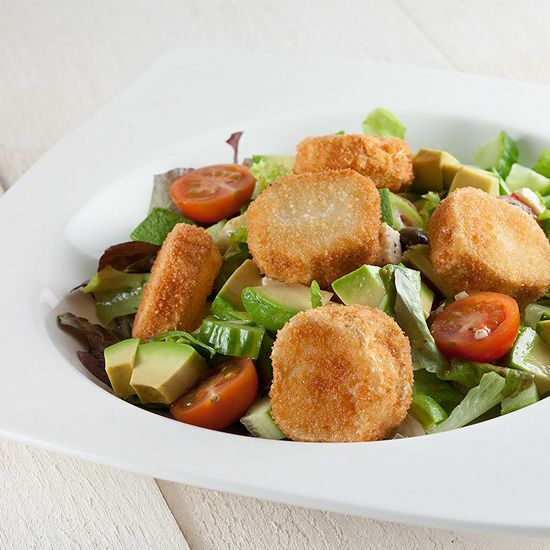 DIVIDE mixed greens, scallions, cucumber, cherry tomatoes – feta and olives – over the plates. PEEL the avocado and chop into pieces. If you open up the avocado earlier, drizzle with lemon juice to prevent it from discoloring. FRY the pieces of goat cheese coated with bread crumbs for about 2 to 3 minutes, until beautiful golden brown on both sides. 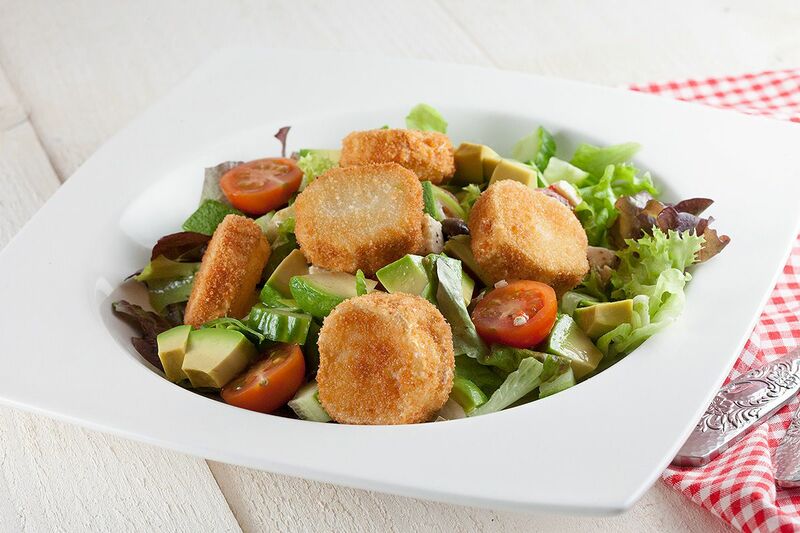 DRIZZLE the salad with lime dressing, divide the avocado and fried goat cheese. Enjoy! 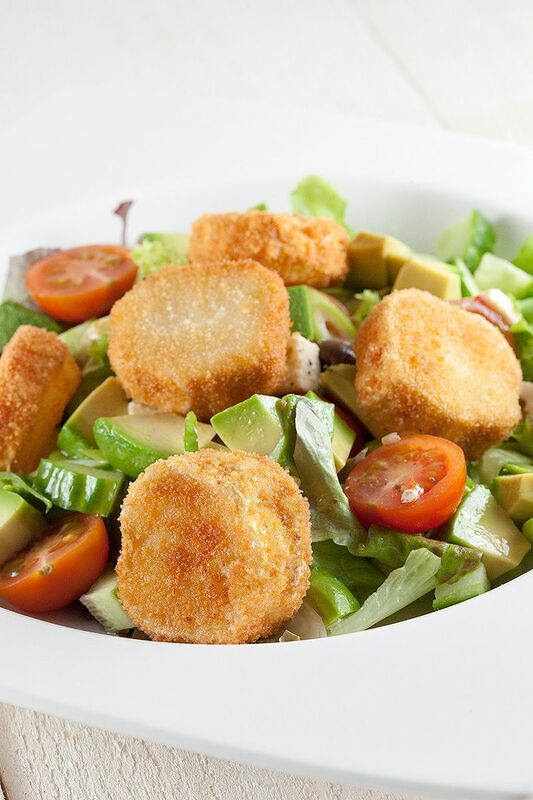 I cannot wait to try the Fried goat cheese salad. It looks and sounds so good.